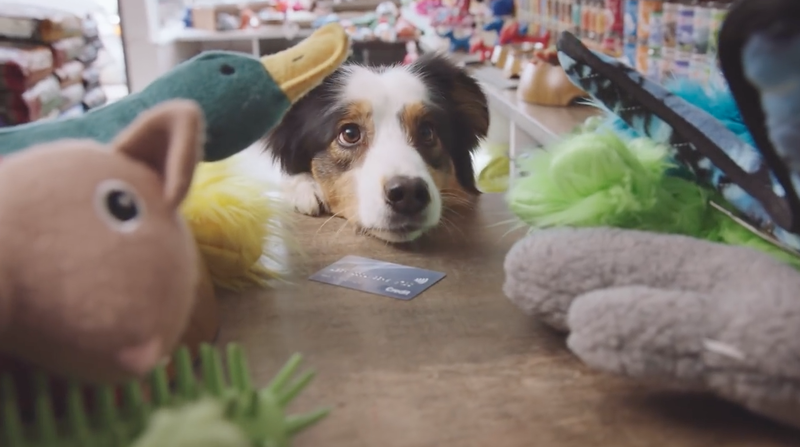 Canadian Banking Ad Asks, What If Dogs Had Their Own Debit Cards? That dog won't hunt, but it will rack up debt via chew-toy impulse buys. Canada's Zulu Alpha Kilo is well known for elaborate self-promotions, like its recently revamped agency website poking fun at agency websites. But the shop does have real clients, and its newest work for Toronto-based "nonprofit interbank network" Interac brings the same lighthearted sensibilities to the world of personal finance. Meet Max, an 8-year-old Australian Sheperd whose obedience classes obviously didn't cover credit card transactions. Unlike the neighborhood dogcatcher, collection agencies can't be foiled by a quick getaway. For clueless non-Canadian readers, the client's backstory may be as interesting as the dog-umentary itself. Interac serves as Canada's own unique debit card system, because the major international card companies generally don't issue such cards there. This leads many Canucks to rely on their credit cards instead—and results can be disastrous for those who, like poor Max, don't have a very good handle on their own expenses. Interac came together in 1984 as a cooperative effort involving five of Canada's biggest banks. The cards it issues function like cash used for small everyday purchases, thereby protecting consumers from losses related to technical errors or fraud and discouraging them from overspending. The company's attempts to become a for-profit business were rebuffed by Canada's federal Competition Bureau in 2010, so for the time being it remains a public service of sorts. The ad makes a bit more sense in this context. And while it might not be the most believable spot we've seen in recent weeks, its would-be breakout star Dr. Matthew Richardson is indeed a real veterinarian. The agency's content division zulubot produced the campaign, which will run on digital and social channels while also appearing on movie-style posters in Cineplex theaters across Canada. Media Experts handled distribution strategy.